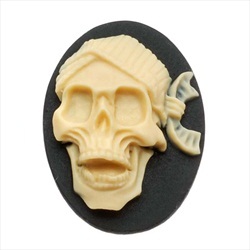 Plastic cameo blanks (make sure they are size that fits the bracelet you selected; they have several designs to choose from, flowers, pirates, skeletons, cats, etc.). A damp towel - this is to wipe extra glue away. It should be damp, not soggy. Put some glue on your first blank on the bracelet. 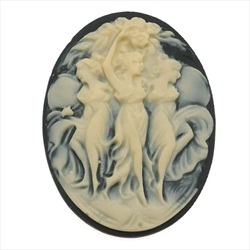 Then apply the cameo. Wipe away any excess quickly. Hold it until it gets firm, about 30 seconds. 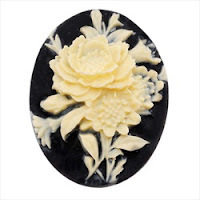 Glue the remaining cameos in place, taking care to wipe any excess away quickly. You'll have to hold each cameo for 20-30 seconds to make sure it stays. And you're done! Wasn't that easy and satisfying? Sometimes you just need a craft that you know will come out looking great and doesn't require a lot of finesse. I love it. I also want one. Easy is good. Love the tease for next week.